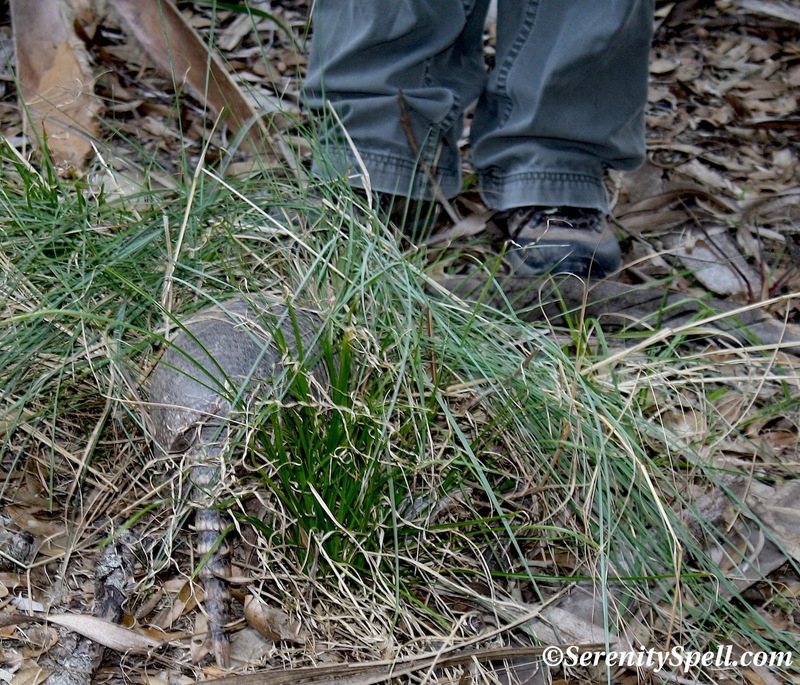 A critter we often encounter along our hikes is the Armadillo. 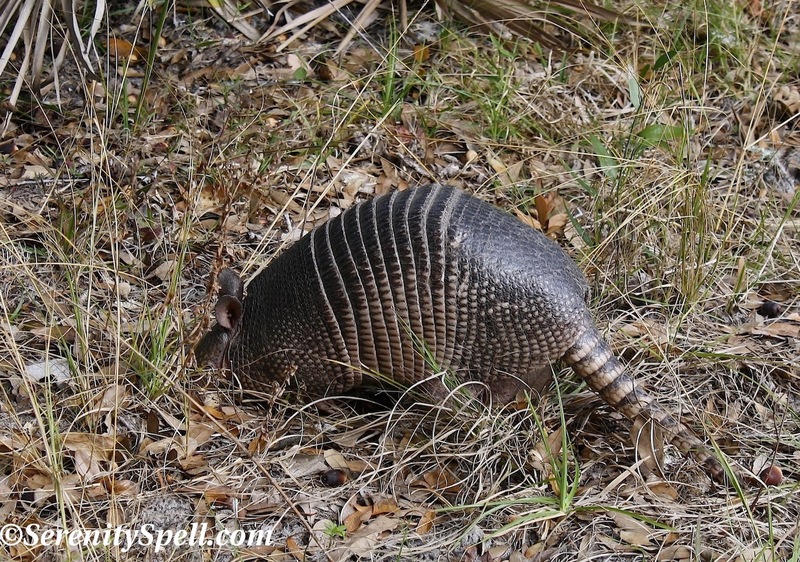 While there are 20 species of Armadillos, it’s the Nine-banded Armadillo (Dasypus novemcinctus) that we see in Florida (it’s also common in many of the South-Central states). I love seeing these “little armored ones” along our hikes, as they burrow for grub and noisily stumble across our path…. Armadillos are native to the New World. They’re solitary mammals with a leathery armor shell and very sharp claws, with which they dig their burrows and scrounge for food, including insects, grubs, and other invertebrates. Oftentimes, when we see lots of little holes in an area, we know an Armadillo is nearby, and will listen for rustling in the vegetation. The have very poor eyesight, and use their exceptional sense of smell to hunt. When I say poor eyesight, I mean it…. These little guys have nearly trundled across our boots when we’ve been especially quiet. Sadly, Armadillos are often the victims of traffic, due to their habit of jumping when startled — right at a car’s fender height. Wildlife enthusiasts are using the Northward March of the Armadillo as an opportunity to educate people about these animals, which can be seen as a nuisance with their burrowing. Armadillos are among the few known nonhuman animal species that can contract leprosy, to which they’re particularly susceptible due to an unusually low body temperature. Leprosy was unknown in the New World prior to the arrival of Europeans in the late 15th century — so at some point they acquired the disease from humans. Humans can only acquire leprosy from Armadillos by handling them or consuming their meat, which actually has a long and continued history. I recently commented on a very ill-conceived and poorly written CNN article citing the Armadillo-leprosy connection; the author hyped up leprosy, instilling fear in the readers with sheer lack of information — a failure to describe the animal and its behaviors. Why bother? More article hits without pesky science getting in the way! 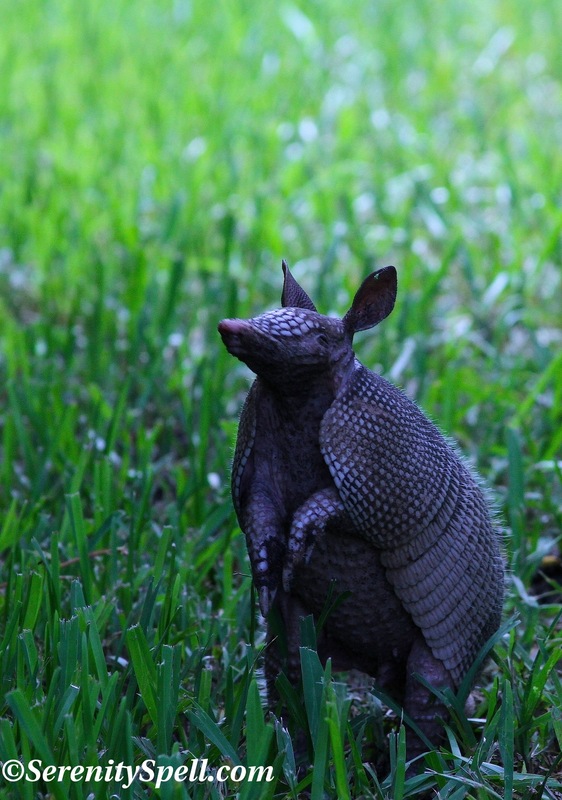 Armadillos are extremely docile and solitary animals. They’re also highly studied in science, not only for their immunity to leprosy, but for their unusual reproductive system, in which four genetically identical offspring are born, the result of one original egg. They’re not the rabid zombies of “Resident Evil” that will attack you in the wild. Misinformation, or lack of information — especially with regards to animals — is simply irresponsible and damaging. 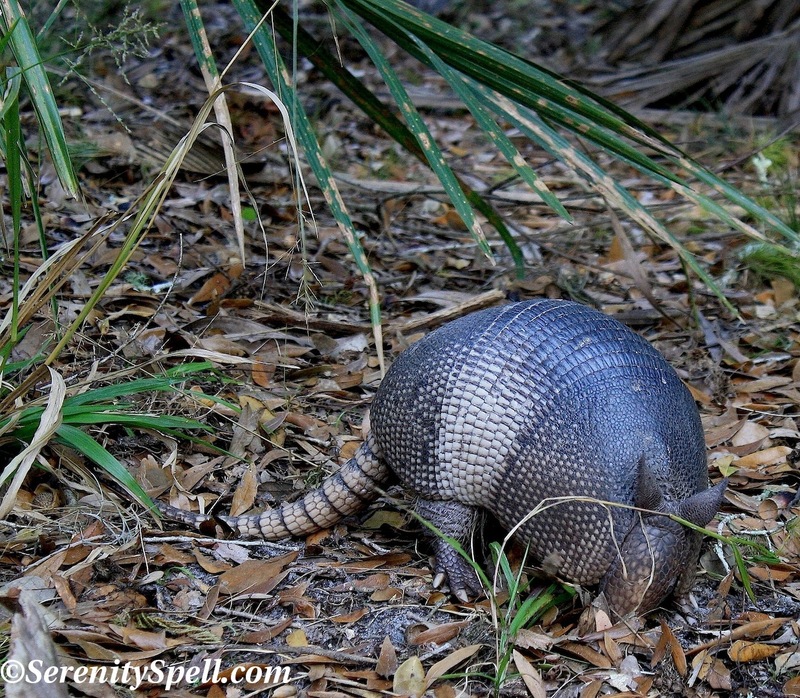 Perhaps the funniest story with Armadillos was when the male had one saunter near him, and was suddenly overtaken with the desire to feel the little guy’s leathery tail. Being both Florida natives and avid hikers, I was curious why he needed to do this, but as soon as his hands were on his tail, the calm girl simply said — “Armadillos are one of the only animals that carry leprosy” (smirk included). I’m so glad I’m not a boy, with weird urges like feeling an Armadillo’s tail. What a strange, and sweet, animal. Nice to have a look. That’s a great description of these little ones… I love seeing them, and when you picture them nearly blind, on their missions for grub — they really are quite sweet. Hahah! Oh, I do PLENTY of “looking.” Especially down here in the Everglades! Thanks for your vote — I don’t usually waste my time commenting on such items, but it *was* CNN, and seeing some of the comments… SHEESH. Thanks, ignorant author. Fortunately, there were some humane and knowledgeable commentators out there as well — trying to balance the ridiculous tide. I love armadillos! Don’t see them nearly often enough. And yes, once, I touched an armadillo! It had its head down in the grass, and I simply put out my finger to touch its back. The little guy did a little jump, and then went right back to his business. I actually have at least one, maybe two, armadillos living in our yard. They like to sneak around at night, so don’t come out during the day. I really need to set up my night wildlife cam! And yes every once in awhile they dig little holes in the yard. But after they do us the favor of eating the grubs, the lawn is healthier because of it! You bring up such a great point… (SOME) people are always so quick to point out aggravations with certain animals’ / wildlife, but besides it being their land (primarily), they usually do an an INCREDIBLE amount of good! These cuties eat so many insects and grubs, I’d happily welcome them! These close-ups are amazing! The one where he’s standing up is stunning! Love the photos… When I see one I chuckle. I also think ancient. Sad about the roadkill issue. When I was bicycling through the South once, I saw more dead armadillos along the road than any other animal. Ditto… I can’t help but smile when I see them! And you’re right, they do look ancient. It’s so sad to see them on the roadsides; fortunately where I am, they’re good with installing fences to keep wildlife from the roads (alligators, etc. ), so I think that helps keep them safer. Gorgeous little animal (and I love the top photo with it looking skyward!) I hadn’t realised they were so accident prone on the roads – sounds like hedgehogs here in the UK, they have no road sense at all. Thanks so much — I’m glad you love them as much as I do! I always smile when we encounter these guys in the wild. I was really happy with that first shot, especially since I didn’t have my telephoto, and had to sneak up on him, on my belly… I was pretty close to the little guy, hee! Nicely done – as always and very informative. Fear of the unknown can always put someone at risk. Maybe after reading this article, a few less people will act out of fear and ignorance but rather with appropriate precautions such as anyone would take with any being – man or beast. Maybe a lot of governments would prefer that their people live in fear (maybe even religion would prefer it it) but if all those so called “leaders” really thought about it , they would get better results, behaviour …… were their population endowed with less fear and more educatiuon (sorry, that was an aside that just came out). Thanks so much! I sure hope you’re right (about the education factor)… You bring up a WONDERFUL point. Isn’t it always good to be cautious with WILDlife? Respect them, and love them? They fear us more than we fear them; they simply want to be left alone in their natural environment — just like ANY other living creature! Sheesh. And Armadillos are such gentle, bumbling little animals — to morph them into mindless beasts is ignorant and wrong. But I agree — fear is, and always has been, a very powerful tool and drug…. Unfortunately, I have only seen them dead on the side of the road. Cute little critters. 🙂 I’ve never seen one in the wild! 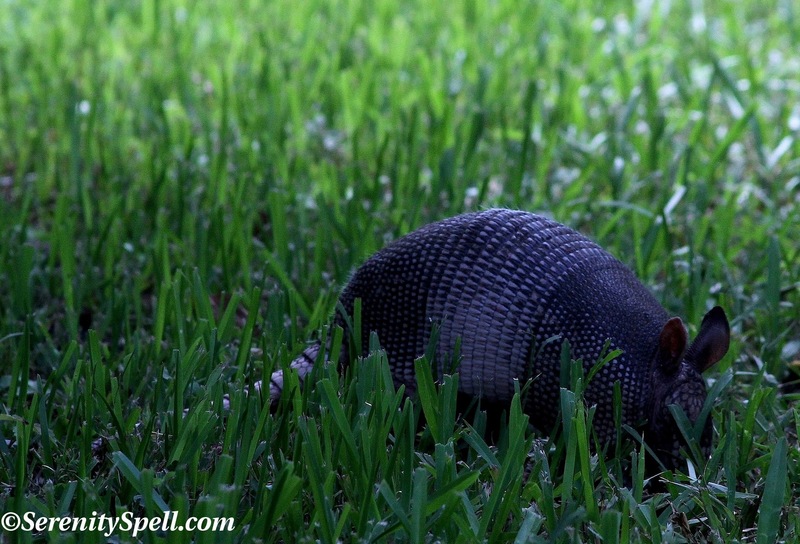 Do you see armadillos often? We do get to see them often — I would say on 90% of our hikes! And I smile every single time I see them, I adore them. 🙂 Fortunately where I am, they’re good with installing fences to keep wildlife from the roads (alligators, etc. ), so I think that helps keep them safer. They are absolutely adorable! I live up north, but we used to own a home in Florida and we’d be down there all the time. I do not remember ever seeing an armadillo, but I wish I did! I have never know of a LIVE Armadillo ! The ones I’ve seen have always been road kill. These are fabulous photographs and how lucky are you to be able to enjoy them live. Aw, really? Never a live one? We get to see them on nearly every hike down here… And they always make me smile! It’s so sad to see them on the roadsides; fortunately where I am, they’re good with installing fences to keep wildlife from the roads (alligators, etc. ), so I think that helps keep them safer. Thanks so much! I always smile when we encounter these guys in the wild. I was really happy with that first shot, especially since I didn’t have my telephoto, and had to sneak up on him, on my belly… I was pretty close to the little guy, hee! They sure are cute little fellows! I’d love to see one. I dimly remember seeing several along the highway in Texas many years ago. I can’t help but smile when I see them — they’re adorable, bumbling little things! It’s so sad to see them on the roadsides; fortunately where I am, they’re good with installing fences to keep wildlife from the roads (alligators, etc. ), so I think that helps keep them safer. Great photos (as usual)! I can’t believe you see them so often. That’s very cool. I thought they were nocturnal. I spent years hiking in Texas where there’re plenty of them, but only remember seeing a pair once at night. I was camping with a friend and they wandered by our camp. They made so much noise walking through the underbrush it spooked us until we got up the nerve to investigate with the flashlight. And the light didn’t bother them at all. They stopped to dig around for bugs, ambled a couple of feet and rooted around some more, completely ignoring us. I thought they were adorable.